Last night I introduced SuperSapiens as a part of the Transitions Film Festival. Below is a copy of my talk that identifies some key concerns about the future trajectory of Artificial Intelligence and how I believe we all need to be involved in deciding what type of future world we want. I also make links to sustainability issues that I’m sure some will disagree with – not sure I like the implications either! That is what we will be treated to in a few minutes. And I have been asked to introduce this film. I avoided it at first, only accepting the second invitation. I avoided because firstly, I am not a futurist, although I do think about the future a lot. I am not a scientist or technology engineer, coder, – I don’t work in the space of robotics or high technology. My interest has been social technologies, how we can collaborate together to generate new solutions to complex and daunting challenges such as climate change and how 9 billion people might live together on Earth in the future. My focus has been on human consciousness and developing it within leadership contexts. Secondly, I avoided because I find the whole topic of inserting bits of ‘thinking’ machinery into our bodies – well quite frankly, pretty obnoxious. Not just off-putting, but really offensive to me on a deep level. It challenges something deep inside me that upon reflection, I think relates to how I view myself as a human being – a living person. For many of us, I believe that this film may be very confronting – and that is not a reason not to watch it. It is essential to witness what is happening at the edges or frontiers of technology and perhaps even open our minds and hearts to the potential positive good that may be possible through this technology. But maybe you are one of the tech guys who is leading the charge and thinks that these developments are all an exciting adventure. If that’s the case, I hope you love this film, and I would like to invite you to consider the longer term implications of the work you are engaging with and the ethical questions that are raised by its very development let alone broad execution and availability. I suggest that these are not questions that a small, and highly skilled community of people should be making alone. I read an article in the Conversation recently that suggested that only about 20,000 people globally have a PhD in the intersection of neuroscience, robotics and engineering that make them active participants in this field of inquiry. That’s quite a small group, and I would guess that the demographics of this group are not very inclusive or diverse either. Indeed the film reinforces this thought. And that raises the question of us all becoming involved in the decisions that need to be made. Can we allow the excited CEOs of new startup companies in silicon valley and similar places (and Adelaide aspires to be one of them), to make decisions that go to the heart of our understanding of our identity as humans? We need to be involved. We need to invest in understanding what is developing and what the implications might be. We can not or rather should not pretend this is not happening. It is. The question I think is, what type of world do we want? What experience of living do we want? Let’s not exclude the challenges that we confront. Problems created in unintended and emergent ways as we have gone about our daily business. Many challenges that many of us don’t want what to acknowledge or know about either. This film is about advances in AI at the very frontiers. It is beyond what we have become used to and is commercially viable in society today. It seems to me that it is of a very different quality than the technology that Siri employs or Facebook engages with to package up vast amounts of data for marketing purposes. Employing a commercial frame, the possibility of humans enhancing certain qualities they possess because it may suit a job application starts to emerge. How will these opportunities both serve humanity and threaten it? How much will it cost and who will be able to afford it? What are the social justice implications? I am both excited and terrified by what is on the horizon and probably too far advanced for anyone to stop? And yet, these advances are being developed by people. I don’t believe that its a law of nature that we have to go own this path. It is a choice. I am as terrified, as some of the experts suggest they are, by the possibility of a machine being created that is capable of thinking better than us. What if they exterminate us? And of course, there is a strong narrative in pop culture (think Hal in 2001 or Terminator ) that explores these possibilities. And then I engage in a conversation with myself. People, humans are more than thinkers. We think but is that our purpose? Is our purpose just to be alive and experience life? And how might these emerging technologies help us to experience life? And I think you might find the ideas that Nick Bostrom promotes here quite interesting in answer to that question. I see sustainable futures as being reliant upon our ability to understand and act in ways that recognise our interconnectedness or interdependence with others (people, species and Earth). For me, this is an appreciation of wholeness. Whole people in whole systems – communities and natural ecologies. As we watch this film about AI, and turning points and human evolution, I will be thinking about what it is to be a whole human. Is there an assumption that wise decisions are just made by the brain? Is this your experience in your life? Or as whole humans, are we more than brains walking around on legs? 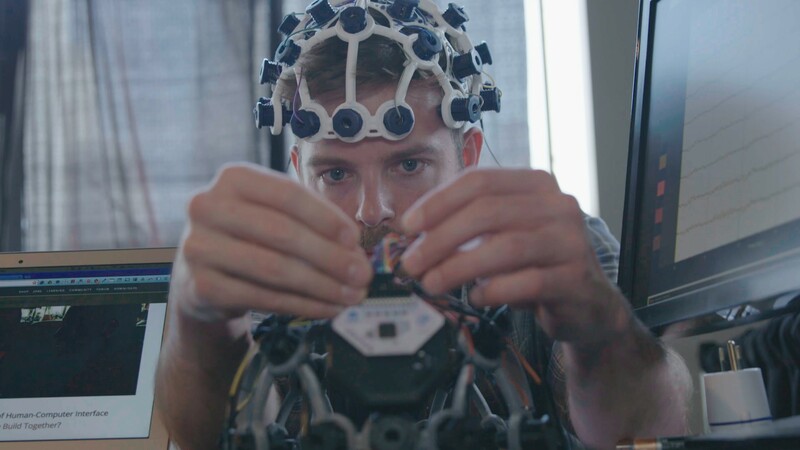 Is it really going to be possible to ‘upload a human consciousness” into a machine? Or layer a device on human consciousness. What is consciousness? In my concern for the sustainability of humanity on Earth, I have started wondering lately if indeed our human bodies and ways of perceiving are capable of enabling us to live in a much larger ecological niche than we evolved from. What I mean by that is, homo sapiens evolved within smaller environmental niches or geographic localities. But we have become so plentiful in numbers that we are now a global species. Our niche is now Earth. I wonder if our bodies and the structures of our minds are capable of supporting us to live in this global and soon to be interplanetary niche? The physical structure of our minds and body evolved to perceive the world in a specific manner and maybe the fact that we have not yet been able to respond to climate change successfully is a demonstration of our inability to make the leap into perceiving in a way that supports living in a global niche? That’s a question rather than a statement. Does it mean that some type of AI upgrade could help us become suited to a new, larger interplanetary, niche? Let’s see what this fascinating film has to offer us! SuperSapiens – go! ← How are you harnessing the power of bringing people together?